When Amazon acquired Whole Foods and prices at the upscale supermarket began to drop, it was an encouraging sign that the merger would eventually make the famously expensive chain a more affordable place to shop, especially for Amazon Prime customers. But when prices started creeping back up and Amazon announced its plans to launch an entirely different, cheaper grocery chain, Whole Foods fans weren't sure what to expect. Thankfully, it looks like prices are about to go down with a new round of price cuts and more deals for Prime members. In an appeal to both loyal Whole Foods customers and Amazon Prime members, the ever-popular organic grocer laid out a new plan on Tuesday to begin a third round of price cuts that it says will save people an average of 20% on hundreds of items. It also says it'll be expanding the benefits and deals for Amazon Prime members, including exclusive weekly deals on popular products across all departments. The lower prices and expanded deals are set to start Wednesday, April 3. “Whole Foods Market continues to maintain the high quality standards that we’ve championed for nearly 40 years and, with Amazon, we will lower more prices in the future, building on the positive momentum from previous price investments,” John Mackey, Whole Foods Market co-founder and CEO, said in a press release. All shoppers -- not just Prime members -- can expect to find lower prices on a hundreds of items, predominantly on fresh produce, like greens, tomatoes, and fruits. 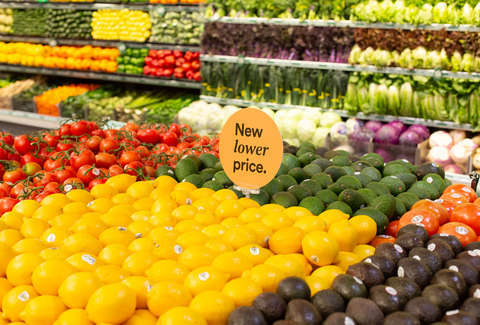 While there isn't a robust list of new reduced prices available, the chain teased lower prices for things like large yellow mangoes ($1 each), mixed-medley cherry tomatoes ($3.49 for 12-ounces), and bunches of organic rainbow chard ($1.99 apiece). If you're a Prime member, you can expect more exclusive weekly deals rolling out over the next few months, in addition to the existing discount that provides them with 10% off hundreds of items in the store. Some of the Prime deals on deck for April include 35% off all Epic brand products, whole chickens for $1.79/pound, 35% off all Justin's products, 20% off prepared sandwiches and wraps, and more. Also, new Prime members who sign up through this link before the end of April can get $10 off a $20 in-store Whole Foods purchase. And not that we're biased or anything, but Prime perks include a whole lot more than cheaper groceries, and you can try it out for free for a full month.